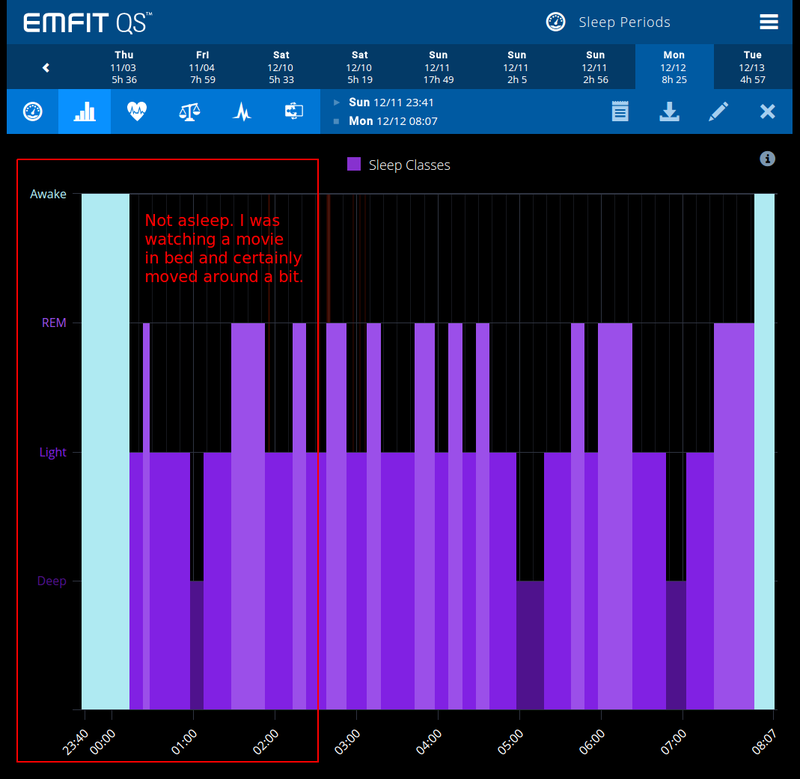 Has anyone tried the Emfit QS sleep monitor? It's marketed as in a higher sensitivity class than the Beddit, and the readout shows indeed a lot more data, including Heart Rate Variability (HRV). I've used both for a while, albeit irregularly, and not under optimal conditions (very large mattress, + partner, while the strips are intended only for one sleeper). The overall impression was that the devices generally agreed, though sometimes gave conflicting readouts, and sometimes mis-classified sleep for non-sleep and counted non-existed bed exit events. 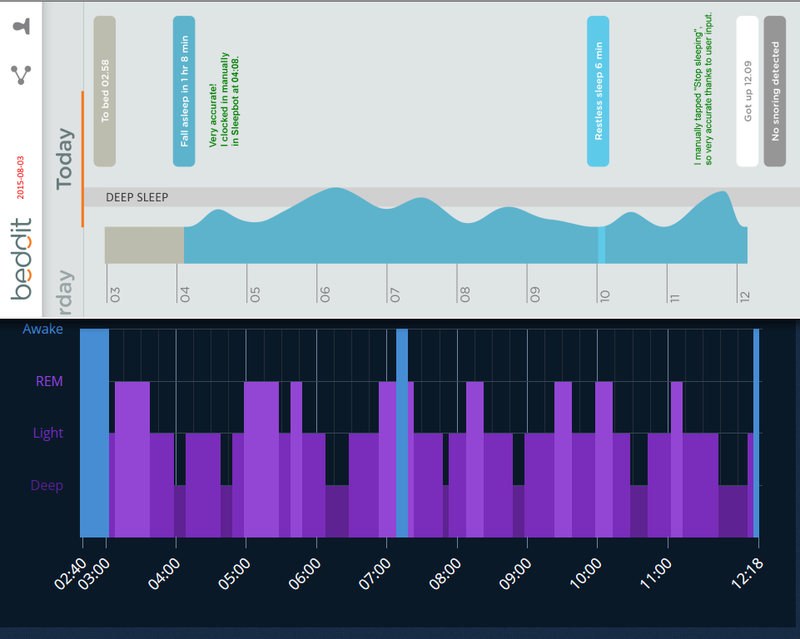 The Beddit was repeatedly surprisingly accurate at detecting when I fell asleep. Here are two screenshots that I've matched on the time axis. The sleep stage identification coincides among the two pretty well. I've started looking at some Emfit QS plots. The first that jumped out was that it thought I was asleep while I was actually watching a movie in bed and moved around quite (I know, not the best sleep hygiene - blame the girlfriend ). Anyway, the Emfit band covers only half the bed and I was roughly in the middle. I'll reach out to the Emift CEO with this feedback - maybe they can adjust their sleep phase detection algorithm to consider no breathing = awake. Does anyone have any experience getting data out of the emfit? It seems like I can only download one day at a time. Hi, I use Sense https://hello.is -- which is "OK" just based on "eye-balling" the data but the EMFIT (esp. the integrated HRV measurement) looks pretty interesting. Any experience with that aspect? I wouldn't recommend the Sense. I'm thinking of using a screen-scraper to download multiple days - anyone else done this either? Since gist comments don't send comment notifications, it'd be great to put that code in a regular repo, so people can submit PRs/file issues/ask questions. That is fantastic, just what I was looking for. Thanks Eric!